Your business was lost in the 1906 earthquake, the insurance company won't pay, yet everyone yuks it up in court recounting the funny things they did "getting clear of debris or in steadying their nerves after the fright." They sound like the very sort of witnesses you want for reliable testimony: People who were scared senseless or immediately got drunk. The court appearances in early 1908 were the the start of a long legal battle for R. C. Moodey, whose shoe store on Fourth street was destroyed by the fire that followed the quake. It was important for Moodey to prove that his merchandise was burned before the building finally collapsed; his insurance policy had a "fallen-building" clause that did not cover damage caused by earthquakes. Unique among all insurers, the Connecticut Fire Insurance Company refused to pay any Santa Rosa losses, and were sued in 1908 by five policy holders, including Moodey. The company lost each case, but their appeals slithered through the courts for years; the California Supreme Court in Sept. 1911 finally decided conclusively in Moodey's favor, over five years after the disaster. Much of the Connecticut Fire Insurance Company's defense rested on proving that a "material portion" of a building had collapsed before the fire. A glimpse of how finely those legal hairs were split can be found in the questions put to the jury in another case a few weeks later. 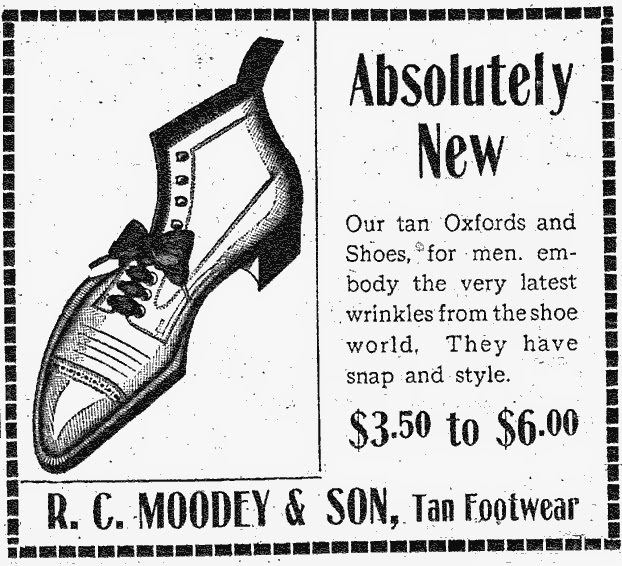 Moodey's shoe store was at 539 Fourth street, currently the location of a hair salon. Between there and the building next door (now the address of Caffe Portofino) was the stairway to the Princess lodging house, where bones and ashes were found four days after the quake. It was first reported to be the remains of a man, woman, and child, yet the coroner issued a death certificate for a single unknown person. This discrepancy is one of several mysteries about the true earthquake body count. The tale of that eventful morning, April 18, 1906, was again rehearsed, at least portions of it were, in Judge Denny's Department of the Superior Court on Wednesday at the trial of the suit brought by R. C. Moodey against the Connecticut Fire Insurance Company to recover $500, the insurance he carried in the Company and which account the Company refused to settle. The Connecticut Fire Insurance Company lost again in the Superior Court of this county last night. The jury in the suit of O. Fountain against the Company found for the plaintiff for the full amount claimed $1,116.66. A few weeks ago R. C. Moodey who sued the company got a verdict in full for the amount of his policy. There are still three suits against the concern. The verdict was returned into court at nine o'clock last night after the jury had been out deliberating since before three in the afternoon. It seems that the delay in the jury room was not over the finding of the verdict but in the answering of a number of interrogatories which are mentioned below. Question: Did the building described in the policy herein sued on and mentioned by the witness fall as a whole prior to its destruction by fire from a cause other than fire? Question: Did a part or parts of the building described in the policy hereing sued on and mentioned by the witness fall prior to the destruction of said building by fire from a cause other than fire? Question: Did a material part or parts of the building described in the policy herein sued on and mentioned by the witness fall prior to the destruction of said building by fire from a cause other than fire? Question: Did a substantial part or parts of the building described in the policy herein sued on and mentioned by the witnesses fail prior to the destruction of said building by fire from a cause other than fire? Question: Did a trivial or inconsiderable part or parts of the building described in the policy herein sued on and mentioned by the witnesses fail prior to the destruction of said building by fire from a cause other than fire? Question: If you find if a part or parts of said building described in the policy herein sued on and mentioned by the witnesses fell prior to the destruction of said building or from a cause other than fire, was the usefulness of said building for the purpose for which it was constructed impaired by reason of the said falling? Question: If you find if a part or parts of said building described in the policy herein sued on and mentioned by the witnesses fell prior to the burning of said building and from a cause other than fire, state whether or not the falling of such part or parts exposed the interior of said building or its contents to the inclemency of the weather? Question: Did a substantial or material part of said building described in the policy sued on and mentioned by the witnesses fail from a cause other than fire prior to the burning of the stock of goods of plaintiffs contained in said building and insured under said policy? Question: If you find that any part or parts of said building described in the policy sued on and mentioned by the witnesses fell prior to the burning and from a cause other than fire, state whether such falling occurred before the said goods insured were attacked by fire.